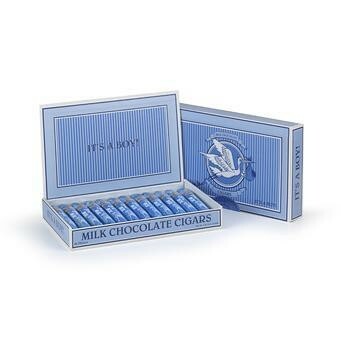 It's A Boy Chocolate Cigars from Madelaine, solid milk chocolate molded 3/4 oz. cigars wrapped in blue foil. Each comes with the traditional band and stork proclaiming 'It's a Boy' printed around the cigar. These are the perfect smoke free way to announce to everyone a boy is on the way or has arrived. Kosher Dairy. Packaged candy comes 24 pieces per case.